Family time by the ocean......memories for a lifetime. This immaculate home, located in the quiet community of Englewood, is just minutes away from the beaches, golf, marinas, shopping and nearby Venice Beach (the shark tooth hunting capital). Our property, Villa de las Palmas, is our vacation dream come true. It has been furnished by a professional interior designer and while looking like a page from a magazine it remains a cozy and welcoming home. I have always said, 'I don't want to vacation anywhere that is not as nice as MY HOME'. I believe we have accomplished that here at Villa de la Palmas. The very large and private Master on suite has a king bed, separate sitting/reading area, heated pool access, walk-in closet and 5 piece bathroom including a jetted spa tub, double sinks and large Roman walk-in shower. The other two guest bed room give you maximum privacy being located on the other side of the home with the main bath located between them. This part of the house has it's own, private entrance. One bedroom has a queen bed and double closet. The other bedroom has two twin beds and a walk in closet. All bedrooms have new high quality luxury linens. The kitchen has beautiful granite counters, stainless steel appliances, a breakfast bar, all new kitchen utensils and small appliances. The kitchen in open to the dining area and greatroom. All rooms have a chic style with a touch of the tropics. The covered lanai is the perfect place for a quiet breakfast. While having your morning coffee you can look over the glistening salt water heated pool, listen to the sounds of the water fall and enjoy the birds and wild life in the tropical woodland behind you. A very quiet and private backyard. If this tranquil setting appeals to you, you have found your next 'home away from home'. We were born and raised in Minnesota. Both having lived in warm or tropical climates in our past, we plan to retire here one day. Not ready to leave the grandbabies in MN, we will vacation here several times a year and share it with you for now. We have been looking for our deam vacation home for several years. From Maui to Mexico, from Dominican Republic to Texas, Florida kept winning our hearts. Englewood's location is perfect. Close to beaches, golf courses, deep sea fishing and cultural events. This home had a beautiful private setting with all the high end finishes we could hope for. The split bedroom floor plan gives you a lot of privacy. The saltwater pool with waterfall is a must and the screened enclosure makes not only the pool area perfect, but also the lanai. As a designer I had to make this home a 'show stopper' with brand new high end furnishing. It's eclectic chic with a touch of Floridian glamore. I think you'll find it beautiful yet comfortable and welcoming. High quality sheets, towels, and beach towels. Attached 2 car garage with gaarage door opener. High quality towels for both bathrooms and separate pool towels. 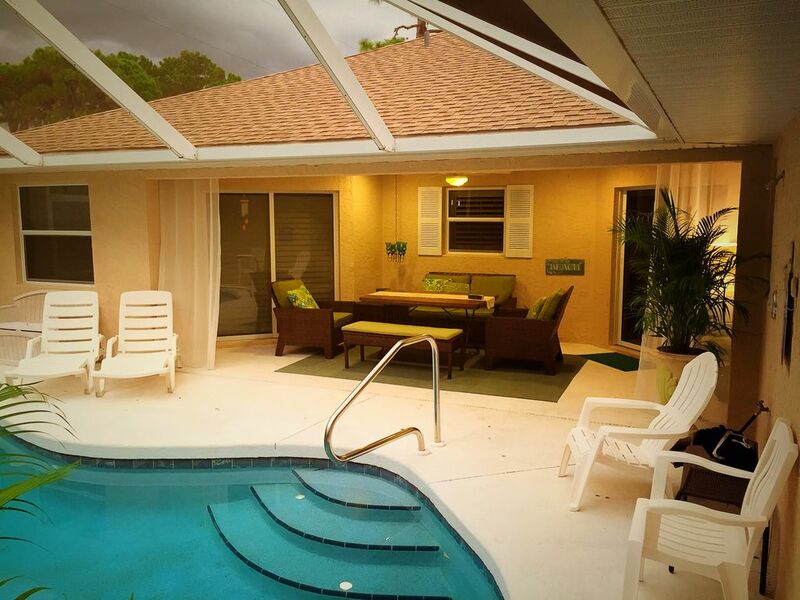 Beautiful enclosed electrically heated salt water pool with waterfall and built in bench. We had an incredible stay at Georgia and Mike's beautiful home and pool! It is close to everything. Georgia and Mike were quick to respond to any concerns. We would recommend this home to anyone! Georgia has a beautiful home! We really enjoyed our stay for the month of January 2019. The set up of this home is so functional and it is in a quiet neighborhood close to everything. We would rent this gorgeous home every year..... if we could! We loved our stay and wanted to say thank you for the mid-stay cleaning. The owners are very lovely and very helpful, they have replied to our messages right away. Wish this was my everyday home!! Our family of four had the best week staying here. The house was so clean and spacious. We enjoyed the pool and dinners out by the pool almost every night. There was even coolers and pool toys in the garage. We explored the beaches up and down the coast so lots of time in the car meant it was great to have a beautiful place to come home to. I would recommend this home to anyone visiting in this area. An absolutely lovely place to stay and relax in Englewood! We will definitely be back to this one! Simply light, bright, airy and COMFORTABLE! Georgia has demonstrated her Interior Decorating skills to the finest on this perfectly appointed tropical nest. We were on a girls (mom and daughter long weekend) and everyone LOVED the pool. Only 10 minutes to the 🏝�. Thank you for a lovely visit! A short drive to Venice Beach. Venice is known worldwide as the Shark Tooth hunting capital. Shark teeth are easily found and collected along it's beautiful beaches. Englewood is known for world class Tarpon fishing and marinas are just minutes away.